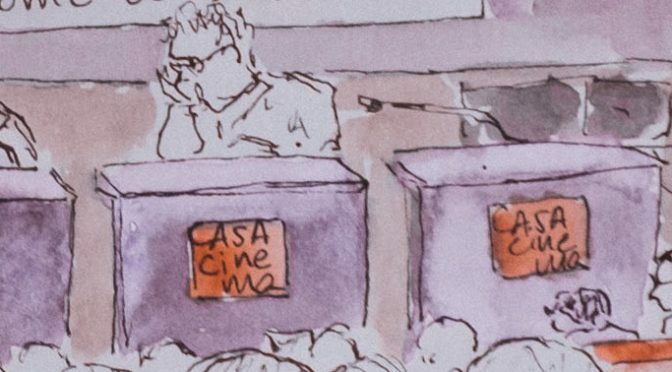 EUscreenXL gathered in Rome last week for our conference on the users and usage of audiovisual archives: “From Audience to Users: Engaging with Audiovisual Heritage Online”. In this series of blog posts we’ll fill you in on what happened. Last week was a busy one for audiovisual archivists! The week in which we celebrated the World Day of Audiovisual Heritage saw no less than six events related to our moving image heritage – not to speak of the International Federation of Television Archives‘ world conference in Amsterdam, which we visited the week before. In Mexico, the SIPAD symposium was teaching a generation of Latin-American archivists how to care for AV heritage. In Switzerland, EUscreenXL partner EBU, the European Broadcasting Union, gathered a group to discuss the technical merits of archival operations, the importance of metadata (including for EUscreenXL) and strategic questions such as whether public broadcasters have a duty to provide archives. In Spain meanwhile, the Europeana network came together to discuss how it would update its ways of collaborating to continue being the hadron collider for cultural heritage. And as Ina’s training team was teaching novices to the field how to take care of moving image materials in its FRAME series, and the Federation of Film Archives’ executive committee met in Stockholm, we, archivists and academics linked to the EUscreen network, joined each other in Rome to discuss topics, tools and triangulations around giving access to broadcast and moving image materials that have withstood the tests of time. The Rome conference we set up filled two days – one in which we focused on stories and examples from the field, and one in which we spent discussing in various workshops. Meanwhile, the conference was also the location for the General Assembly of the EUscreen network and for scholarly activities, such as a meeting of the European (Post)Socialist Television History Network and the editorial board of EUscreen’s VIEW Journal of European Television History and Culture. So in a nutshell: a lot of words being exchanged, a lot of bonds reinforced and a lot of ideas shared. This was truly a week in which the famed double helix of preserving and giving access to audiovisual heritage, as Peter Kaufman so eloquently put it once, was at the heart of the conversation. Italy’s Ministry of Culture has a representative for film culture. That is in and of itself a remarkable feat and – if you ask us – a sign of being an utmost civilized nation. Mr. Nicola Borrelli opened the conference, stressing the importance of film and audiovisual heritage for the country and mentioning it as one of the most important issues of the current Italian presidency of the European Union. Our morning speaker on the first day was Mr. Roger Felber. An example of a clip British Pathé made more Relevant to contemporary audiences by changing its title. Mr. Felber is a British business man with an impressive track record, whose investment group owns the British Pathé collection. His opening talk may seem like a strange choice for EUscreenXL. Why put all this effort in developing a portal such as EUscreen to then open your arms to organisations who use YouTube? While it is true that the series of projects and collaborations that brought forth EUscreen predates the existence of the video mogul , it is of course no stranger to EUscreen’s members. Various organisations, such as Cinecittá LUCE, TV Romania’s archives and Sound and Vision, have made substantial amounts of video available through Google’s platform. While for archival curation many of us question its lack of rich metadata, for example, there are obvious advantages to using the platform – audience reach being high on that list. What we hoped to learn from Mr. Felber was how this reach can be seen, thought of, explored and improved upon. His experiences did not disappoint. As Mr. Felber admitted, his organisation does not move without it resulting in “cold, hard cash” – an approach that the mostly public service directed organisations in EUscreen are less prone to. Mr. Felber relayed the steps his organisation had taken to publish its 95.000 videos online in one go. After discovering many of their films had already made it online via private persons’ interests and unvetted activities, the organisation decided to make the jump. YouTube has a robust advertising scheme and a fingerprinting algorithm that allows content owners to redirect the advertising income from third party or individual uploaders they would’ve otherwise missed out on. A win-win situation for British Pathé’s rights holders. Mr. Felber then – without the use of PowerPoint or presenter’s notes – kept his audience captivated with his story of how the group focused on creating impact with the collection. He bundled British Pathé’s lessons for audience reach in a maxim consisting of three R’s: Regularity, Relevance and Reliability. Publish materials with a dependable regularity, make them relevant to the people who need to see them and make sure you can be considered a reliable source. An important lesson for British Pathé – and a rather frightening idea to the researchers in the room – was that changing the titles of the videos made them more find- and clickable – a lesson mirrorred by recent developments in the publishing world, where ‘clickbait’ titles and title-focused enterprises such as Upworthy are all the rage. British Pathé puts music under all its silent clips, unlike this film fragment from the Cinematek in Brussels. In the panel that followed suit, project coordinator Eggo Müller welcomed Sonja de Leeuw and Mark Williams at the table to discuss specific parts of the online delivery process. Topics included questions such as audience specificity – a general audience consisting of many smaller niche audiences – and the true meanings of audience engagement. Markedly different were the approaches to media the academic researchers in the room voiced – their primary concern is that of the untouched, true original. Another hot topic for discussion – recurrent in the EUscreen family – was that of allowing free access to a collection that is used for footage licensing. The balance was decidedly positive: besides generating extra income via YouTube’s advertising, the British Pathé collections have become much more known because of its publication, and footage sales have increased in never before served territories. Linda Kaye closed the Q&A session with a comment on the resources of the metadata. In British Pathé’s tumultuous history, its original paper archive was once tossed in the bin, rescued from there and now available for researchers at the British Universities Film and Video Council. A challenging anecdote to close this session, that reunites the need for a broad audience reach with the importance of the daily grinds and duties of archive operations.